If you’re a fan of Nintendo, today has been a fun, exciting, and scary day for you. Once again, the house of Mario has decided to put its entire well being on the line for a completely new type of games controller. The question is: are they making a good bet? The jury is still out, and the lines to try out the Wii U at Nintendo’s booth are so long that Nintendo has actually “closed” the entire Wii U section of their booth off several times today. I did get a chance to hold the new controller, however. 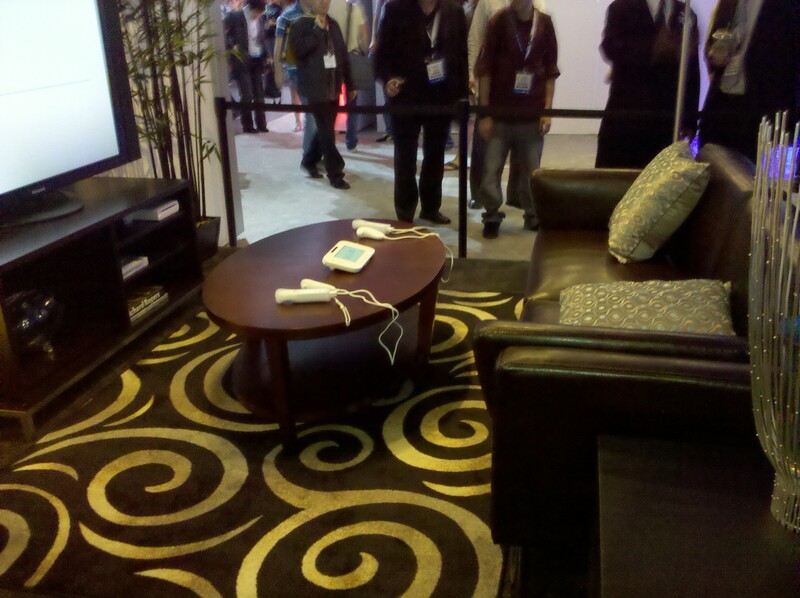 A couple young Nintendo ladies were roaming around a roped off Wii U exhibit (see below). Paranoid about theft and bad pictures, Nintendo has physically tethered each of the women to her Wii U controller with a white rope. I can imagine the great surprise when a thief discovers that his stolen controller has come with a pretty lady attached to it. Tethering aside, E3 goers like myself were allowed to touch and hold the controller as long as no one was snapping photos (heaven forbid we see an actual Nintendo fan holding the controller). It took a while to get people to stop snapping pics, but I was able to get the controller in my hands. The first thing I noticed was how large this controller really is: 10.5 inches across. If you’ve seen a 7-inch touch tablet like the BlackBerry PlayBook or Samsung Galaxy Tab, rest assured, this is bigger than that. It’s also about twice the thickness (around .9 inches thick and twice as large around the triggers) of a common tablet. It makes up for its size with its light weight. Though it’s much larger than a current generation controller and has a 6.2-inch touchscreen inside of it, the Wii U controller feels relatively balanced and lightweight. I was able to hold the unit with my index fingers on the L and R buttons and my middle fingers on the two trigger buttons easily enough. Though the shoulder buttons feel relatively natural, I was a bit disappointed that the face buttons (ABXY), D-pad, and control sticks are taken straight from the Nintendo DS line of handheld systems. They are small, very small. This isn’t as much of a problem for the directional pad, but having to use flat circle pads instead of full analog control sticks may get a bit tiresome during long bouts of gameplay. Considering the width of the controller, the buttons feel especially small, much like how the GameCube controller’s direction pad felt abnormally small when it came out. The controller is definitely running on an embedded lithium ion battery, which means you’ll have to charge your Wii U controller at night. Conversely, it also means that Duracell and Energizer battery sales may take a dip. My Wii controllers eat up more batteries than I can count. Finally, the 6.2-inch screen was lit up and displaying the Wii U logo, but nothing else. It appeared fairly bright, but it’s hard to estimate the resolution of the screen. I didn’t notice a screen dimming toggle either, though this feature may be embedded in the Wii software. The controller does have a front-facing camera, speaker, gyroscope, accelerometer, microphone, what appears to be infrared (for Wii remote interaction), and who knows what else, so dimming functionality is definitely not out of the question. I’m hoping to spend some time with the full Wii U demos during E3 and will post updated impressions of the system then. For more information about the Wii U, check out our full “What U need to know” on the newly announced system. Molly also posted up some press photos of the new console.